Ajit Vaidya is a partner with Kenealy Vaidya LLP. His practice includes prosecuting, licensing, litigating, and counseling clients on intellectual property matters. He has extensive experience with prosecuting patents, preparing patent opinions, and counseling clients on developing intellectual property portfolios. 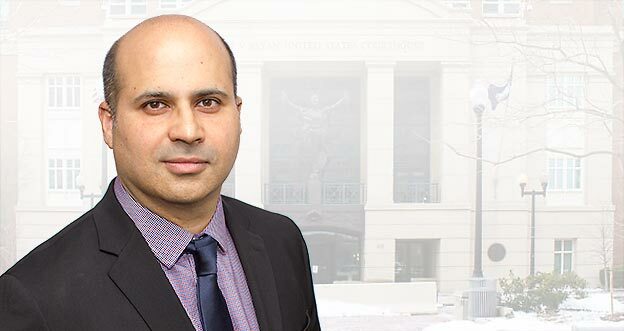 Mr. Vaidya has also represented clients in patent infringement actions before a variety of federal district courts and has experience in all phases of litigation including discovery and motion practice and trial preparation. Additionally, he has in-depth technical experience in such areas as semiconductor devices, chip fabrication, image processing, telecommunications, electronic materials, medical devices and computer software. Mr. Vaidya graduated with a bachelor’s degree in materials science engineering from the University of Illinois at Urbana-Champaign in 1991 and received his law degree from the University of Dayton School of Law in 1995. He is admitted to practice in the District of Columbia, Illinois and before the U.S. Court of Appeals for the Federal Circuit and the U.S. Patent & Trademark Office. Mr. Vaidya was previously a partner with the international law firm of Hogan and Hartson LLP (now Hogan Lovells LLP). Mr. Vaidya has lectured both domestically and internationally on intellectual property matters, most recently at the India IP Rights Summit in Mumbai, India. Ajit Vaidya has extensive experience with prosecuting patents, preparing patent opinions, and counseling clients on developing intellectual property portfolios.